encouraged to understand how science can be used to explain what is occurring, predict how things will behave, and analyse causes. Speaking and listening is highly valued throughout science lessons, as this not only encourages children to explore scientific vocabulary but also share and develop their ideas with others. The children are also encouraged to develop their ICT skills through relevant science explorations such as the use of data loggers and digital microscopes. An emphasis is placed on ‘Working scientifically’ through inspirational and engaging activities. 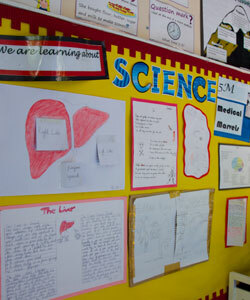 We strive to develop a love of science where questioning and an exploratory attitude is at the heart of learning.